A lot of TV wall mounts nowadays have added additional widgets. They have added extra holes to accommodate larger VESA standards screw hole distances. Some TV wall mounts have added extendable arms. Others have made their design smaller or larger to accommodate the market. The ECHOGEAR Full Motion Articulating TV Wall Mount Bracket is like The Galapagos or the Madagascar of TV wall mounts; not much evolution, but still classically strong, reliable and practical. 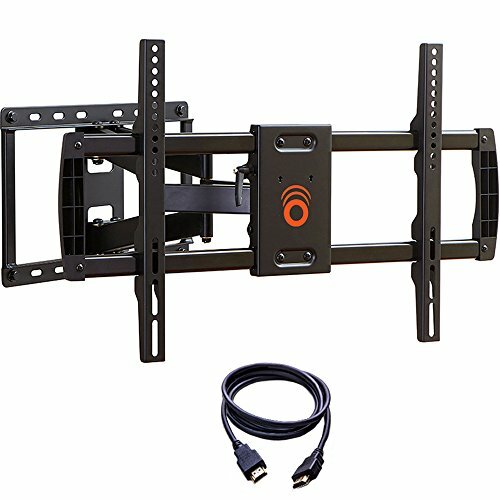 This TV wall mount has been with this design since its inception, and it services the top of the TV screen food chain in terms of size; this wall mount can carry up to 70 inches of TV size dimensions. It can also carry 132 pounds of cable wirings, electronics and TV sets. But before we talk more about this full motion TV wall mount, we should take a look at the company first. This is designed, manufactured and offered by ECHOGEAR, which is a relatively young enterprise. They launched in April of 2015. They have many products to offer to the market, but they specialize in Audiovisual accessories, surge protectors, AV cables and TV mounts. 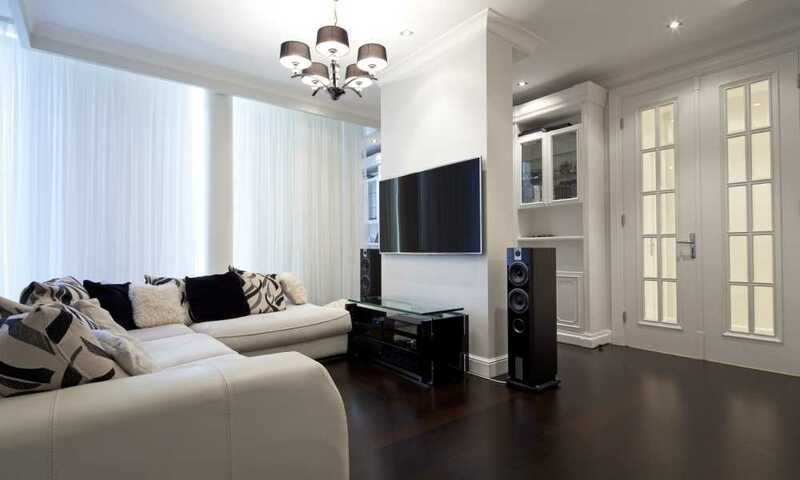 Their TV mounts in particular are highly rated. They have currently eight stands, seven of which are wall mounts. This Full Motion Articulating TV Wall Mount Bracket is still their best product by a long mile. This is the flagship product of Echogear, and for good reason. It is durable and the steel is of good quality. The brackets are slim but sturdy, and the hinges, hooks and screw points are all located strategically. It is also a heavy lifter, being capable of handling 132 pounds of weight. This TV wall mount’s reach is also something you can literally see; the braces and tabs allow you to adjust the size capacity, but the recommended range is from 37 inches to an enormous 70 inches. Let us go more in depth about this TV wall mount. This TV wall mount is compatible with VESA screw holes distancing. They start from 200 x 100 millimeters up to 600 x 400 millimeters in some patterned increments. The metal arms, tabs and braces are immensely sturdy. Once they are fixed, they will move as per the hinges and joints, but the base attached to the wall is immovable. There are two metallic arms that lead to a very strong hand which carries the TV set. Total distance from the wall if stretched is 16 inches. Compared to other TV wall mounts of this size and weight capacity, that is definitely above average. To save even more space, you can retract the TV screen to 2.6 inches. That still gives some breathable space between the TV set’s rear and the wall. It also gives it a neat look and saves space. This wall mount measures 17.8 x 12.9 x 3 inches, which is quite big. This wall mount weighs 18 pounds. 132 pounds is the highest recommended weight. This means that for every pound of its weight, it has 7 pounds of carrying capacity. This ratio is below average for the market. However, unlike other wall mounts at this size, it can tilt 15 degrees up and down. The swiveling mechanism is great. It can go 150 degrees left and right, and rotations work great. It fits 16 inch studs only. This is immensely easy and fast to install! The company website offers installation using only three steps. The installation manual is also quick to be understood. There are quite a few parts, but it is easy to know which screw goes where. Most of the wall mounts of this weight and size do not tilt or swivel and even if they do, it is only very minimal like tilting for only 3 degrees and no swivel at all. This product, however, can tilt 15 degrees, which is what wall mounts two times smaller can do! Also, while most of the heavy lifters cannot extend much, this can extend 16 inches and retracts 2.6 inches. That is a big space saver. It prioritizes flexibility over weight capacity. The carrying weight is actually below average between competing products. There are a lot of parts, so please make sure that all parts are accounted for. It is easy to see why ECHOGEAR Full Motion Articulating TV Wall Mount Bracket is a popular bestselling wall mount. It can carry large TV sets and can carry mobility as well. This is perfect for restaurants, bars and even houses with a lot of people viewing it! It is a great wall mount for TV sets and is highly recommended.